So many of you are new to my little blog and may not know about my involvement with the Making Things Happen movement. I’d love to invite you to read more about it here. See, four short years ago, I was a girl with a dream – of owning a little paper brand and making a difference with it. In a room in Watercolor, Florida, I met Lara Casey and Gina Zeidler, who became two of my very best friends. Now, we travel the country together meeting other men and women with passions, purposes and dreams for a life that really means something. It’s been one of the most incredible experiences of my life. And in two short weeks, we’ll be making our last tour: Austin, Phoenix, Los Angeles, Chicago (sold out!) and Atlanta. I cannot wait. It’s bittersweet to bring this chapter to a close. Those 550 of you who have become part of my heart will always be there. Life is too short to sit around and let life happen to you. If you have any questions about MTH, I hope you’ll email me directly or visit our site to learn how to register. We’re nearing sold out for this tour! I posted today on our tumblr, a message about gratitude. Sometimes, as busy wives, mamas, businesswomen, sisters, friends, etc etc etc we get so caught up in the day to day. We forget to stop and literally smell the roses. We are so blessed. Even in our struggles, even in the trials God sends us through, we are so fortunate. 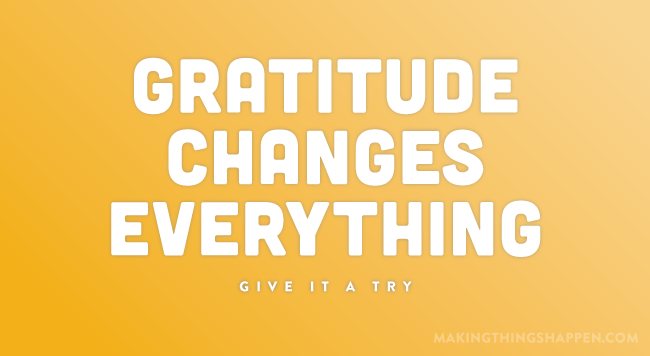 A spirit of gratitude changes everything. You can also read our Tumblr for daily inspiration here.